A payment gateway is an e-commerce application service provider that acts as an intermediary between you and your merchant account (the application that allows the flow of money to and from your bank account). It authorizes payments for e-businesses, online retailers and the like. It is the equivalent of a physical point of sale terminal located in most retail outlets. Payment gateways protect credit card information such as credit card numbers by encrypting them, to ensure that information is passed securely between the customer and the merchant and also between merchant and the ONTRAPORT. We integrate with quite a few gateways. The majority of these gateways don’t require you to obtain a merchant account as they already seek those out for you automatically. Your first step is to select and set up a payment gateway outside of ONTRAPORT; that way you can grab the credentials needed for integration. You can use as many gateways as you wish to use. If you’re entirely unfamiliar with the concept of a payment gateway, a good place to begin is with a free Stripe account that requires no credit approval. The standard PayPal gateway is often an easy first choice, but it does not support selling subscription, payment plan, or upsell products, and has some limitations on how successful and declined transactions are handled. If you’re planning on selling subscription products or products with recurring payments you’ll want to upgrade to a more traditional payment gateway such as Stripe, PayPal’s Payflow Pro or PayPal Pro (formerly known as Website Payments Pro). 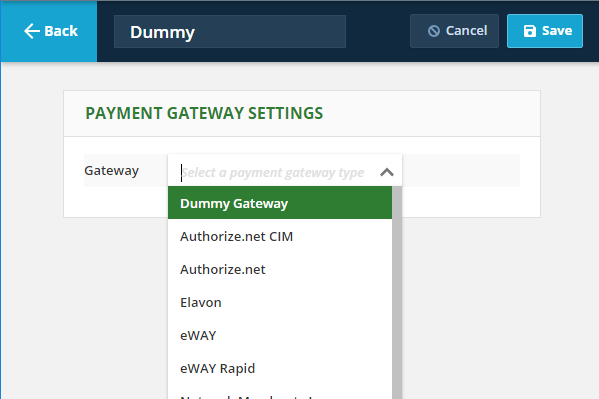 Note: We strongly recommend setting up the Dummy Gateway as well, as you can run test transactions using it. Note: Many gateways accept transactions in currencies from around the world but restrict use to companies located in certain countries. The footnotes indicate not only the currencies accepted, but the specific countries that gateway operates in as of publication. For all the currencies listed as "Other", check with the gateway to verify that they operate within that country. 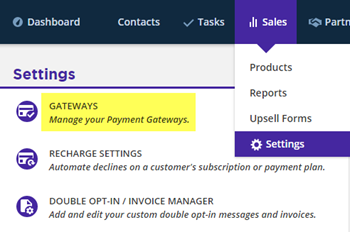 If you are not editing an ONTRApage or ONTRAform, navigate to Sales > Settings > Payment Gateways and click the + New Gateway button. You can also access the Gateway configuration page from within an order form block in ONTRAforms or ONTRApages. Start by editing the order form block. Click on Payment Settings in the Palette. Click the Select Gateway drop down under PAYMENT GATEWAY and select +Create New Gateway. Name it "Dummy" and click Save & Edit. 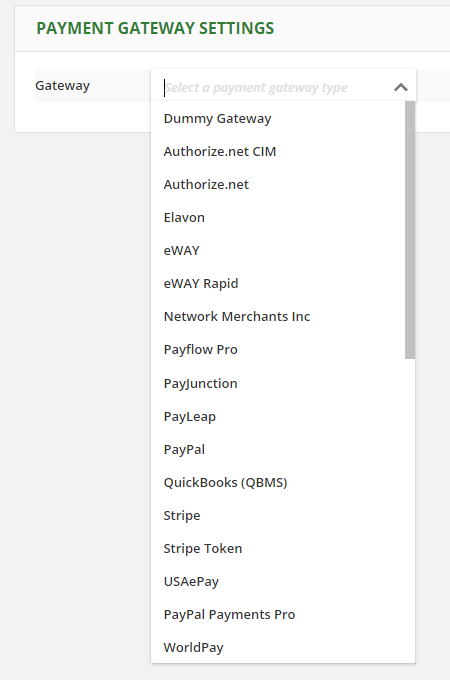 Either method will lead you to the new Payment Gateway Settings page shown below. Add a gateway name. This is not shown to your contacts, so we recommend naming it "Dummy". Select the "Dummy Gateway" configuration from the drop down. Then, click the blue Save button at the top right. 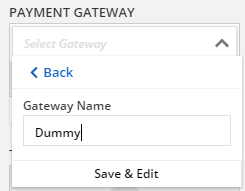 If you are creating the Dummy Gateway from inside an ONTRApage or ONTRAform order form block, you will be returned to that editing session and can now select the Dummy Gateway from the Payment Gateway drop down. The Dummy Gateway accepts only one dummy credit card number, 4111-1111-1111-1111. You can use any CVV code and any expiration date that is in the future to test how your order forms work prior to setting them up with a real payment gateway. Disable or set to "not required" CVV or CVS checking (it is illegal to store the three digit CVV code and payment plans, subscriptions, upsell offers and free trial periods will all fail on the second payment). While not required, we recommend you disable or set to "not required" any address or zip code verification. These checks often cause transactions to fail unnecessarily. Check to make sure the gateway is working and processing transactions correctly, in the correct currency for your ONTRAPORT account, before going "live" with your sales campaign. Give the gateway a name. This name is only used internally and not seen by your customers. In the Select a Gateway Type drop down box select your gateway. Provide the integration details obtained from the individual gateway. These are usually one to three key numbers. Note: We strongly recommend setting up the Dummy Gateway also. It is used to test your order forms and Campaign automation related to sales. 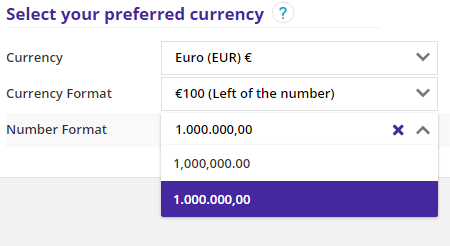 ONTRAPORT does not do any currency conversion. Your account will use the currency symbol you choose for all transactions, even those processed before you changed your currency setting. If you have existing sales it is strongly recommended you download sales reports and transactions to keep track of the sales in the old currency. Verify that the payment gateway operates in your country. Many gateways accept transactions in currencies from around the world but restrict use to companies based only in certain countries. See all countries PayPal supports. eWAY Rapid supports countries including Australia, New Zealand, United Kingdom, Singapore, and Hong Kong. For Malaysian Ringgit transactions, eWAY requires the company to be based in or have a bank account in Australia or New Zealand. See all countries Stripe and Stripe Token supports. Contact Worldpay support to determine if your country is supported. Configure your payment gateway to accept the currency you wish to bill in, and note that there are potential costs associated with your choice. Some gateways, such as Stripe, will accept different currencies but convert them into your bank's default currency. That can lead to additional fees assessed by your bank as the funds are converted. Make sure you have the gateway configured so that you will avoid these charges. Other gateways will reject the transaction if the currency type does not match one you have configured, or blindly process the transaction in your default currency. This can lead to loss of sales or sales value. ONTRAPORT is not responsible for these charges. It is your responsibility to verify the gateway configuration is correct. Integrate your payment gateway with ONTRAPORT. 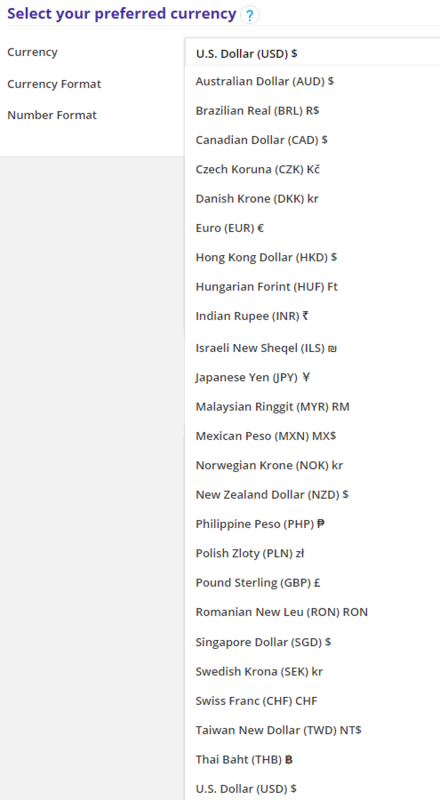 Visit Administration > Data > Localization to select your currency setting in ONTRAPORT. 1 ONTRAPORT's number format currently includes 2 decimal places, even when the Japanese Yen (JPY) is set as the currency. Because the Yen does not allow fractional amounts any value in the two decimal places is simply ignored (not rounded). Q. Which gateways are best for non-US currency? A. There are two main factors to consider. First, does the gateway serve companies in your country, and second, does the gateway offer the currency you want to use? Many gateways accept transactions in currencies from around the world but restrict use to companies located in certain countries. Verify that your company can use the gateway first. eWAY Rapid supports Australia, New Zealand, United Kingdom, Singapore, Malaysia and Hong Kong. Q. I want to sell in multiple currencies, can I do that with ONTRAPORT? A. Our system allows one currency only, with the exception of PayPal, that can be configured for USD or your chosen local currency. We recommend you use separate ONTRAPORT accounts for each currency. An alternative is to use UltraCart, a native integration with ONTRAPORT that does support multi-currency handling, with up to 12 different currencies accepted. Q. I changed my currency in ONTRAPORT last month, and now I have $3,278 in currency conversion charges. I want you to pay them. A. Your payment gateway should have been set to bill in the same currency or configured with a bank account that accepts that currency, as clearly indicated in our configuration articles and inside ONTRAPORT when you set the currency type. Your payment gateway received the payment in the funds you specified and your bank converted them. The responsibility for the currency conversion charges are between you, your payment gateway and your bank. ONTRAPORT will not reimburse you. Q. I just changed my currency in ONTRAPORT and immediately all of my orders are being refused! I am losing money by the second! Fix this! A. You have to set the payment gateway to accept the currency you select in ONTRAPORT. Your payment gateway is refusing the order form submissions because we are sending a different currency type than it expects. 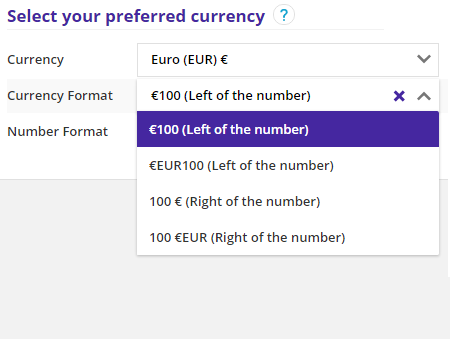 This is explained in all of our documentation and in ONTRAPORT on the currency selection page. Q. I changed my currency setting in ONTRAPORT a while back, and I just noticed you did not convert all of my sales history from USD into my new currency, yet you show those transactions with the new currency symbol. How am I supposed to know which sales were in USD and which are in my new currency? A. 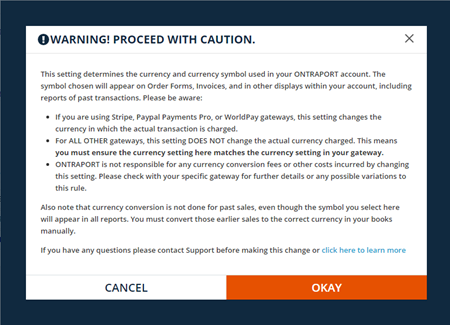 Our configuration documentation and a warning inside ONTRAPORT advises you that the currency symbol will change system wide, and that no currency conversion is attempted. You should have exported your sales history at the time of the currency change to make the adjustment to your books prior to the conversion change. Nothing in your history has changed, so you can still do this now. Export the sales history dated prior to the changeover and correct your books. If you need the date of the currency change in your account please contact Support. Q. Do I have to modify all of my existing order forms, including legacy Smart Forms with Order Forms on them? Some of those are installed using the raw "HTML Version for Geeks" option. A. All of your ONTRAPORT Order Forms will update to using the new currency symbol, including ones using the raw HTML Version code. This assumes you have not modified the code. The change will automatically propagate to legacy Smart Forms with products on them, ONTRAforms with order form blocks, and ONTRApages with order form blocks. I need instructions for integrating WorldPay, which is also listed within Ontraport. Are there instructions for this? Not sure why I'd want the return URL to be an ontraport (http://forms.ontraport.com/v2.4/paypal_redirect.php)rather than my own website? If you set the Return URL to the ONTRAPORT link we will redirect the contact to the Thank You page or page indicated in the "Run these rules if payment is processed successfully" on the individual order form.